It has been 40 years since John Carpenter subverted all expectations with one of the most famous horror films in the history of cinema: “Halloween.” The film achieved box office gold and blew away audiences and critics alike, and set the conventions for horror films to come. There were various sequels that followed after the iconic 1978 film, but most critics and fans agree that none of them were able to reach the heights set by the first film. Now, nine years after the release of the last “Halloween” film, we have a new “Halloween” with a new production team behind it. Directed by David Gordon Green and written by Green, Jeff Fradley, Danny McBride and produced by Miramax and Blumhouse Productions, the new “Halloween” ditches all the films in the franchise and acts as a sequel to the first film. Jamie Lee Curtis returns as Laurie Strode, now estranged from her family, living in a her own survivalist compound and still traumatized years after the night Michael Myers murdered her friends and tried to do the same to her, years ago. The plot kicks off as Michael Myers escapes while being transferred to a new facility and comes home to kill again. I can say that while the film is much better than it could have turned out, it still has some faults. The film does really well with many of its technical aspects, such as cinematography, editing and sound. Director David Gordon Green shows clear inspiration from Carpenter’s 1978 film, even if he is just mimicking a lot of what made the first film so good. The film includes a lot of lingering shots and camera pans that feel unsettling and voyeuristic, and help create this palpable sense of fear, and play well into the shot composition, where our eyes naturally scan the frame for the films more disturbing elements such as Michael, who often is seen off-screen, unfocused, but almost always present. 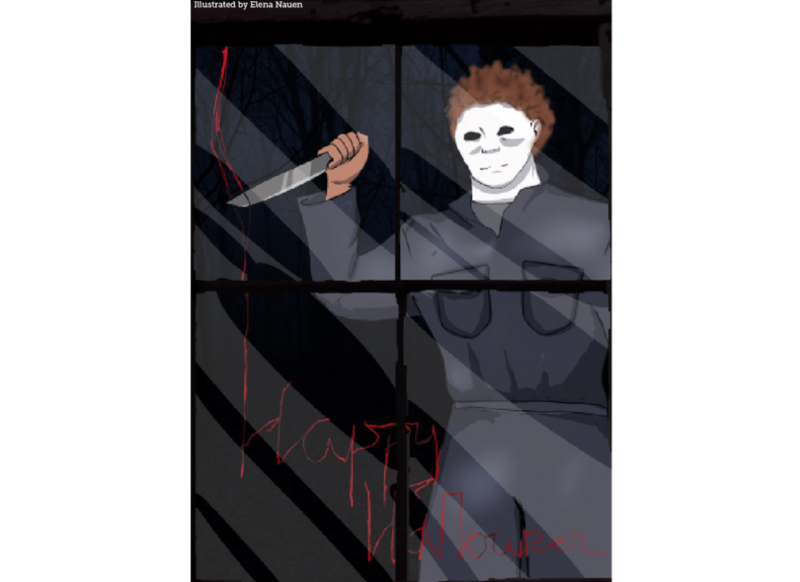 One noteworthy scene is a long continuous shot of Michael’s killing spree as he goes from house to house on Halloween night. The film’s focus on lighting is well done in how it mimics many of the tricks that were used in the original Halloween. With low-lit indoor environments and natural lighting for outdoor scenes that make many sequences feel incredibly tense as if Michael could emerge from the shadows at any second. The lighting and cinematography resonates well with the film’s editing where the film uses an interplay between quick cuts in rapid succession to make everything on screen feel all the more frantic when Michael attacks and slow methodical cuts that help keep the suspense when he is not shown on screen. The new score by John Carpenter also plays a vital role in the film; just as it did with the first film it keeps the fear on a simmering boil and then goes up several notches when characters are being hunted by the masked villain—all without feeling annoying and over done to the audience, which is a problem that many horror films have. But while the film does many things right, it also sags in some areas. Even though Jamie Lee Curtis is the main character, it feels as if the film does not spend enough time with her, instead opting to spend time with other characters, many of whom are, quite frankly, not as interesting and often live just to be cannon fodder to be killed later on. This also brings up the problem the film has with some of its writing. Some of the dialogue comes off as very odd and contrived, with characters holding dialogue between each other or saying lines that feels unnatural and creates this feeling of mood whiplash given the circumstances that they are in, and some of the acting, like with the opening sequence, comes off as a bit silly. One plot twist is thrown in near the end that feels so ridiculous that it comes off as out of place. The new “Halloween” film is by no means a fantastic sequel to the original “Halloween.” However, it is still leaps and bounds better than the other schlock that came before it. The film is still quite good and the films pros weigh out a lot of its cons. The problem seems as if the filmmakers tripped up here and there while trying to make a worthy sequel to the original “Halloween.” In the end, I give the new “Halloween” three stars out of four.